Your company is connected to the Internet, isn’t it? So what WAN protocol do you use to connect to the Internet? Chances are, that if you have a T1 leased line to the Internet or a private network between locations, you use one of these 3 WAN Protocols: HDLC, PPP, or Frame-relay. Let’s explore the differences and similarities of these protocols. HDLC stands for High-Level Data Link Control protocol. Like the two other WAN protocols mentioned, HDLC is a Layer 2 protocol (see OSI Model for more information on Layers). HDLC is a simple protocol used to connect point to point serial devices. For example, you have point to point leased line connecting two locations, in two different cities. HDLC would be the protocol with the least amount of configuration required to connect these two locations. HDLC would be running over the WAN, between the two locations. Each router would be de-encapsulating HDLC and turning dropping it off on the LAN. 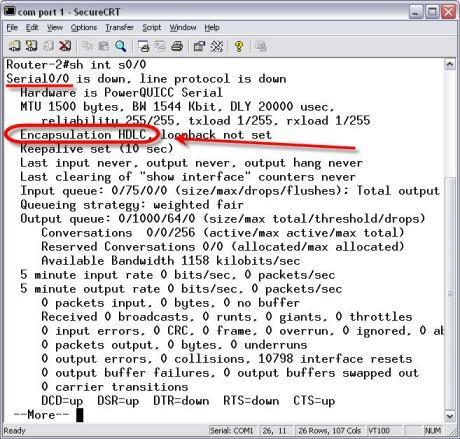 HDLC performs error correction, just like Ethernet. Cisco’s version of HDLC is actually proprietary because they added a protocol type field. Thus, Cisco HDLC can only work with other Cisco devices. You may have heard of the Point to Point Protocol (PPP) because it is used for most every dial up connection to the Internet. PPP is documented in RFC 1661. PPP is based on HDLC and is very similar. Both work well to connect point to point leased lines. 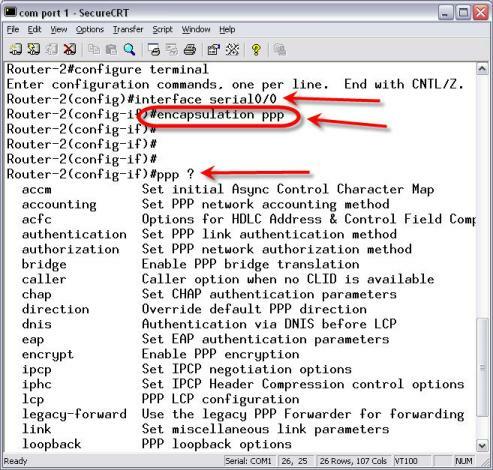 PPP has several sub-protocols that make it function. Link quality management monitors the quality of the dial-up link and how many errors have been taken. It can bring the link down if the link is receiving too many errors. 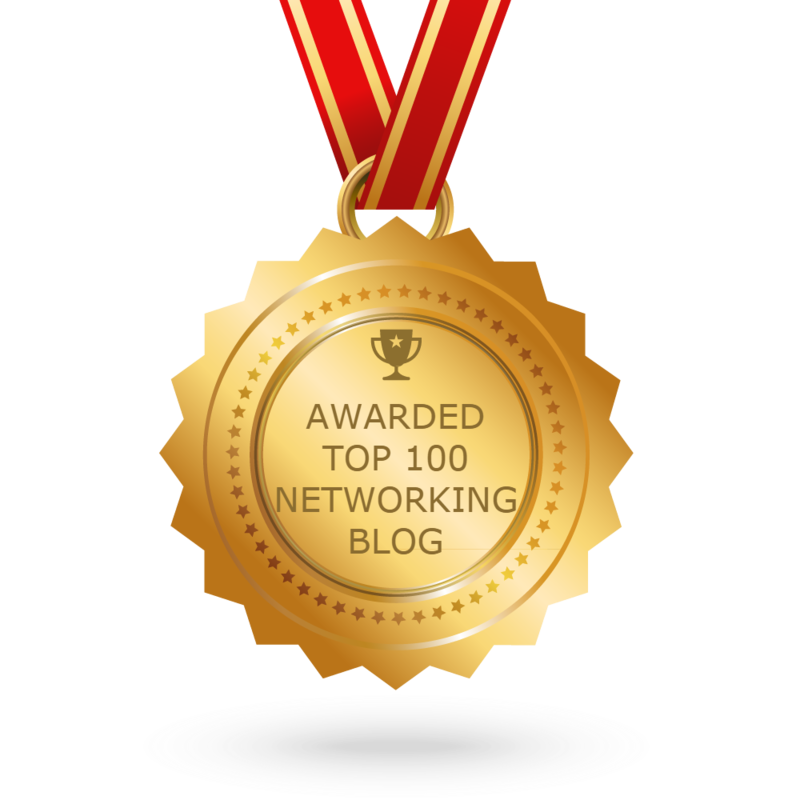 Multilink can bring up multiple PPP dialup links and bond them together to function as one. Authentication is supported with PAP and CHAP. These protocols take your username and password to ensure that you are allowed access to the network you are dialing in to. After changing the encapsulation to ppp, I typed ppp? To list the PPP options available. There are many PPP options when compared to HDLC. The list of PPP options in the screenshot is only a partial list of what is available. Frame Relay is a Layer 2 protocol and commonly known as a service from carriers. For example, people will say “I ordered a frame-relay circuit”. Frame relay creates a private network through a carrier’s network. This is done with permanent virtual circuits (PVC). A PVC is a connection from one site, to another site, through the carrier’s network. This is really just a configuration entry that a carrier makes on their frame relay switches. Obtaining a frame-relay circuit is done by ordering a T1 or fractional T1 from the carrier. On top of that, you order a frame-relay port, matching the size of the circuit you ordered. Finally, you order a PVC that connects your frame relay port to another of your ports inside the network. Ability to have a single circuit that connects to the “frame relay cloud” and gain access to all other sites (as long as you have PVCs). As the number of locations grow, you would save more and more money because you don’t need as many circuits as you would if you were trying to fully-mesh your network with point to point leased lines. Improved disaster recovery because all you have to do is to order a single circuit to the cloud and PVC’s to gain access to all remote sites. By using the PVCs, you can design your WAN however you want. Meaning, you define what sites have direct connections to other sites and you only pay the small monthly PVC fee for each connection. LMI = local management interface. LMI is the management protocol of frame relay. LMI is sent between the frame relay switches and routers to communicate what DLCI’s are available and if there is congestion in the network. DLCI = data link connection identifier. This is a number used to identify each PVC in the frame relay network. CIR = committed information rate. This is the amount bandwidth you pay to guarantee you will receive, on each PVC. Generally you have much less CIR than you have port speed. You can, of course, burst above your CIR to your port speed but that traffic is marked DE. DE = discard eligible. Traffic marked DE (that was above your CIR) CAN be discarded by the frame-relay network if there is congestion. FECN & BECN = forward explicit congestion notification & backward explicit congestion notification. These are bits set inside LMI packets to alert the frame-relay devices that there is congestion in the network. We talked about three different WAN protocols that every network administrator should be familiar with. HDLC would be the most common protocol used to connect to the Internet but all three WAN protocols are offered, by carriers, as possible encapsulations to use to connect to the Internet.